The image of the Orkalypse was quite visible in the community and I received a lot of feedback. On my facebook page, on CMON, as well as on BoLS. Well, even during the Orkalypse build and paint process I was conducting a lot of Internet research, especially on Amphibious Assault and Beach Landing (as the PONOS looks rather amphibious and many of you suggested to build a beach landing dio). During that research I stumbled accross some images that sparked a new idea. It shows two Marins of the USMC Recon landing on a beach. Wow, their pose projects such a strong message, really tense. If I have such a strong idea, I need to build it. The idea is to have some Special Forces infiltrating an Ork complex to do "force recon" - sabotage, assasination, cause havoc. With this in mind I assembled a small base (actually a lid of a storage glass) and 3 troopers. Not exactly the same pose, but I think I can make this work. So I thought about an Ork complex and how to display it on such a small area and decided to concentrate on an area directly behind the fence/wall, showing the breach where my team entered. Since the troopers are operating clandestine, they can't really use a laser rifle or a bolter, so I decided to go for some silenced rifles. Here you can see the scopes and supressors. ...and decided to rearrange them a bit. To make the scene a bit more dramatic I decided to add a dead Ork. Afterthat I worked on some more details. Like adding twin magazines and folding stock to the rifles. 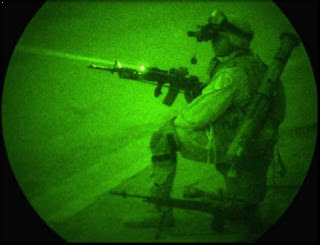 Well, since it's going to be some night action, they also need night vision goggles. They also received some midified backpacks. Here you can see the implet mines or explosives they will use. What do you think of the idea to paint the whole thing in green night vision colors? Here are now the high quality images of the "Orkalypse Now" diorama. And this was the completed build.